It has been a ROUGH end to 2018. It was a ROUGH beginning to 2018. It’s just been a long, long year! Started off the year with a friend going into the hospital and never fully recovering. He passed a couple of months ago. My husband and I bought the business that he and his friend had run together for almost 20 years. I spent the entirety of last February sitting next to my daughter’s hospital bed, holding her hand before she finally couldn’t fight anymore. Said our final goodbyes to her on my wedding anniversary. I welcomed two new grandchildren into my life. I trained for, and completed my first half marathon. I became heavily involved in the politics of my place off the grid, which has kept me super busy. I ended up with the cold from hell in the middle of December and am going on three weeks trying to fight this thing off. I haven’t been this sick in I don’t even know how long. I have just been going and going and going and my body is letting me know that it’s had enough! So here we are in the new year. I can already guarantee that this week will end with zero workouts. And then I can pretty much guarantee you that I won’t be jumping back into my workouts with cross boxing. It’ll be a complete, 100% start from scratch game plan if I can ever stop hacking up a lung and blowing my brains out through my nose. So 2019 is not off to a rip-roaring great start, but I have high hopes moving forward from this cold (sinus infection/ear infection/raspy lungs). 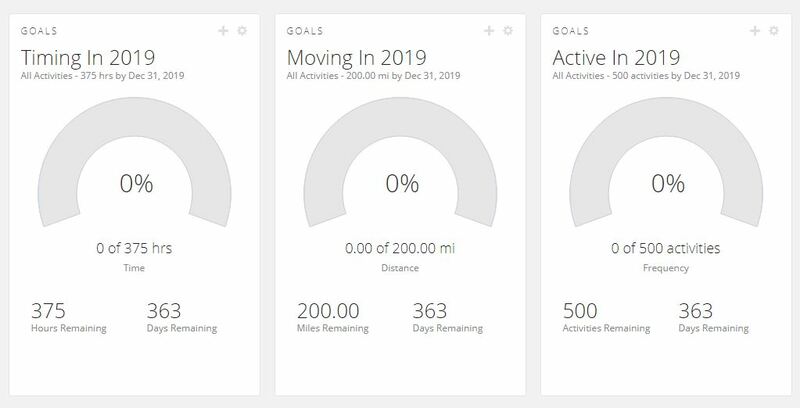 I’ve created my fitness/health goals for the year as I do every year. But this year I’ll be changing things up a bit. I’m so burned out on running right now that the thought of even lacing up my shoes makes me cringe. I’m hoping that taking a little break from it (not completely STOPPING, just backing off) will help rejuvenate my feelings for the sport. So I’m cutting my runs down to one day a week through the first quarter and then we’ll see how I feel from there. I’ll fill in with some weight training and fun classes at the Y and see if I can reset my brain to even WANT to ever do a workout again. (see…burned out). So my goals are threefold: At least 45 minute workouts on the days I work out. At least 3 workouts per week (the math on that might not add up in your brain, but I do yoga most days, which counts as an activity but not a workout in my brain). For the first quarter I’m planning on 4 miles a week runs (one day) and may readjust the mileage goal in Q2. Or I’ll decide that one day a week of running is suiting me and I’ll leave it at the 200. The most important thing to me this year is to not stress myself out about my workouts. I feel like I’ve been in training mode for the past two years straight and that has really messed with my head, so I’m pulling back and working out for the sheer joy of working out. I would like 2019 to be as stress free as possible! We’ll see how that goal works itself out. AND….this is about as much as I get in to New Years Resolutions. Not a fan.